A panel of experts met in early May for “The Humanities and the Future of the University.” Convened by the Mahindra Humanities Center and funded by the Office of the President, the discussion explored ways of reviving interest in the reflexive and analytical disciplines that make up humanistic study. After 18 months of quiet effort, a committee of scholars from within the Faculty of Arts and Sciences (FAS) released a set of three reports this week on teaching the arts and humanities at Harvard College. The lengthiest one, “Mapping the Future,” is a 70-page analysis of what the trends are, what the stakes are, and what steps the future requires. In sum, the trend is downward for undergraduates concentrating in the arts and humanities. The stakes are high for beleaguered departments. And the action steps are plain: more attention to freshmen exploring concentrations, broader courses, and more cross-discipline collaboration. The three reports were inspired in early 2012 by a request from Sorensen. 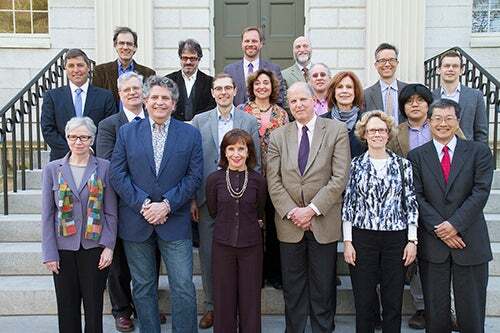 The first, “Mapping the Future,” focused on the philosophical underpinnings of the humanities, its present state at Harvard College, and its aspirations. A second, the Curriculum Working Group Mission Statement, took on curricular reform and announced a first step: a series of “gateway” courses to the humanities to be offered in the fall. A third report, “Addendum,” characterized the Mahindra Humanities Center at Harvard as an intellectual crossroads, a place where the integrative spirit of the humanities is already playing out (though largely for faculty, postdoctoral fellows, and graduate students). Its author was Center Director Homi K. Bhabha, Anne F. Rothenberg Professor of the Humanities, who called for gateway courses that “audaciously cross disciplinary hubs” at Harvard. Bhabha was one of three co-chairs of “Mapping the Future,” which combined statistics, philosophy, historical context, and aspirations. Joining him were Sean Kelly, professor and chair of the Department of Philosophy, and James Simpson, the Donald P. and Katherine B. Loker Professor of English. After studying data that goes back decades, “Mapping the Future” acknowledged that art and philosophy are “where the meanings are,” but increasingly where the undergraduates are not. Since 1966, the number of humanities bachelor’s degrees awarded nationally has slipped from 14 to 7 percent. At Harvard College, the percentage of humanities concentrators has fallen from 24 to 17 percent since 1954. If you count history (not officially regarded as a humanities concentration at Harvard), the six-decade decline is even steeper: from 36 to 20 percent. Among arriving freshmen in the Class of 2006, 27 percent said they would concentrate in the humanities. When the Class of 2016 arrived, the number of would-be humanities concentrators had sagged to 18 percent. In a way, it gets worse, said Simpson, whose literary specialties are medieval and Renaissance English, but who appreciates the power of data. Within three semesters, he said, 57 percent of that 18 percent surrender their plans to study the humanities. More than half move over to the social sciences, chiefly to government, psychology, and economics. Develop resources for that “freshman-year challenge,” including a strong humanities component during Visitas and freshman orientation. Open an arts and humanities version of i-lab. Found a student group modeled on the Institute of Politics at the Harvard Kennedy School (that is, a student-run venue to host visits by top practitioners). Create more art and exhibition spaces. Get multiyear funding for internships that allow undergraduates to experience an arts career firsthand. Investigate more cross-School courses and co-teaching. Arrest and reverse the decline in humanities concentrators. Focus efforts on the first three semesters of study. Continue providing “demonstrably excellent undergraduate teaching,” as measured by satisfaction levels. Reaffirm that Harvard’s critical tradition of undergraduate teaching is general and interdisciplinary. Expand ways of collaborating with the social sciences and with other Schools. Emphasize that the humanities represent solid launching pads into professional schools. National statistics bear out the findings. Professional schools such as law and medicine admit humanities majors at similar, and sometimes higher, rates as any other branch of study. The humanities produce graduates who go into a surprising range of careers. Kelly mentioned a few students who graduated with degrees in philosophy. They are lawyers and journalists now, he said, along with comedy writers and graduate students. To illustrate the intellectual diaspora, starting next semester, he added, “We are very interested in bringing alumni back” to tell their stories. The Curriculum Working Group was co-chaired by Julie Buckler, professor of Slavic languages and literatures, and department chair, and Shigehisa Kuriyama, Reischauer Institute Professor of Cultural History and chair of the Department of East Asian Languages and Civilizations. Citing the “profound and direct relevance” of the humanities to undergraduates, the working group acknowledged that the focus must be on Harvard College, and in particular on those first three semesters of study. It recommended creating more curricular and extra-curricular pathways into the humanities that could attract concentrators from every field of study. That requires expanding outreach to freshmen. And it requires expanding advising programs. Creating new pathways would also involve renewed attention to the Freshman Seminar Program. That means encouraging faculty to offer such courses, especially ones that involve compellingly fundamental themes like time, justice, love, or happiness. Eventually, Freshman Seminars might cluster around a common theme, opening the way to joint activities or meetings. By 2014-15, gateway courses may be gathered into a proposed sequence, Humanities 1 and Humanities 2. Starting this fall, the working group also proposed creating an arts and humanities section in the undergraduate course offerings, along with an enhanced navigation tool that makes it easier to find courses thematically. The group proposed junior and senior seminars to bridge the arts and humanities disciplines with all the others. This echoes a subtext with the Humanities Project, to build community. The curriculum group also looked beyond 2014-15. It envisions eventual course clusters that explore a single theme or problem, creating a “mini-culture” of students focused on a common issue. The future could also bring a humanities secondary field designed for concentrators from other divisions. Eventually, curricular reform could even mean piloting an interdisciplinary humanities concentration, a rigorous program of individual study modeled on the current idea of special concentrations. A new secondary field is being discussed, too, the public humanities, which would illuminate the role of culture in statesmanship. “The arts and humanities create a sense of civic virtue,” said Sorensen. “Mapping the Future” includes imperatives arising from decades of data. It outlines a complex action plan looking ahead a decade or more. But it also acknowledges the challenges the humanities face. Chief among these are the “hostile arguments” that exist most powerfully in the corridors of political power, in the thinking of skeptical parents, and in the minds of college graduates saddled with record school debt. The “vocational argument,” common during debates at American kitchen tables, avers that humanities departments “are failing in the vocational marketplace” and that declining enrollments are proof of that. To paraphrase the line of argument as explained in the report: To be successful, a university discipline studies money, attracts money through research, and promises graduates a lot of money in future income. Finally there is the “technological argument.” For centuries, societies throughout the world have understood themselves by way of immersion in their cultural art forms: hours at a loom or a potter’s wheel; nights of tales told by firelight; endless days sunk into worlds created by the printed word. “Mapping the Future” is not about to recommend blowing up a centuries-old humanities tradition that still resonates with universal truths. The authors simply recommend bringing traditions into the 21st century in a way that speaks to modern concerns. In its first pages, “Mapping the Future” outlines what Simpson called the “transferable competencies,” the tools provided by the arts and humanities to describe experience, to evaluate it, to imagine it, and then to transform it. The tools of evaluation are required for the act of criticism, a central practice of the humanities. This “rigorous, receptive responsiveness to art and philosophy,” the report said, “provokes … an answering responsibility to the world.” Evaluation denies that the business of the humanities is precious and private. It provides a critical framework for judging the world. Besides outlining the tools that remain unchanged, “Mapping the Future” goes back in history to origins that matter, to the landscape of what the humanities once were and how they adapted in response to a changing world. Later in the Middle Ages came the studia humanitatis, which resembled the modern humanities. Its chief practices were rhetoric, philology, and history — separate from theology (and later from science). With this new order came a radical idea: To understand the past, you have to recover original texts, the ad fontes, whose rigorous parsing is central to humanities scholarship to this day. In the 15th century came another radical idea, that the humanities were not just scholarly, but were prompts to civic action. The practice of “rhetoric” — structuring arguments for persuasion, often in oratory — was thought to underlay good government. During the Renaissance, the humanities added the idea that art-making “was an intellectual as well as a manual activity,” according to the report’s authors. In turn, the classics encouraged the idea that both texts and archaeological artifacts could illuminate the human experience. In the mid-19th century, the humanities began to acquire a modern cast because the disciplines became secular. Modern hermeneutics (textual interpretation) started with Bible criticism, but even the Bible was eventually viewed as a historical document rather than a divine one. Today, the humanities contain three traditions, each in tension with the others: disinterested scholarship, practical skills (such as rhetoric), and enlightened civic action. At the same time, the humanities are in tension with the modern world because the claims of liberality seem counter to the way the world works. We are, say the humanities, free from the pressures of economic survival, free from vested interests in producing knowledge, and free from ideological (or religious) pre-judgments. Amen Igbinosun and Kristen Browne star in “The Boston Abolitionists Project," a new production developed by the American Repertory Theater and the A.R.T. Institute, the theater’s graduate training program. The collaborative work is part of the National Civil War Project.